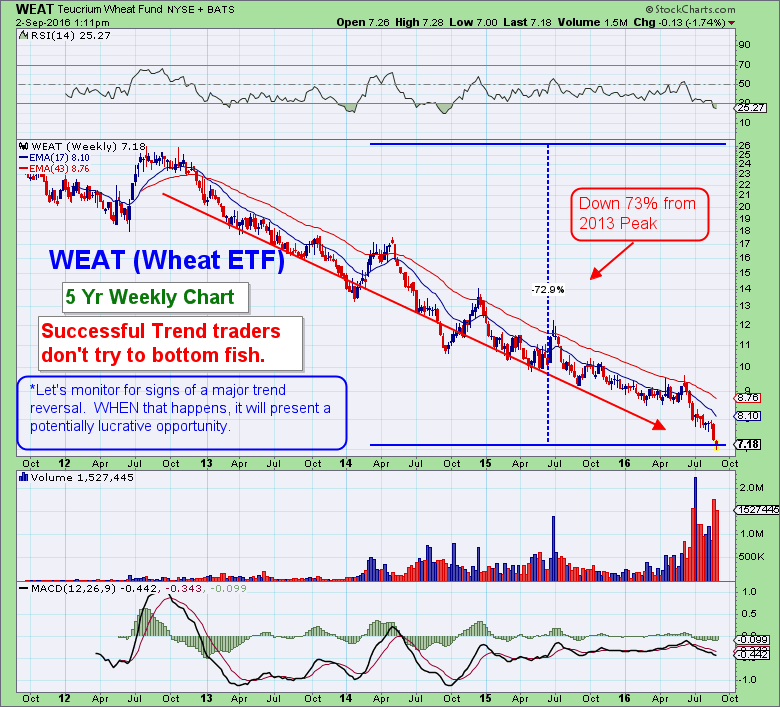 Weekly Metals Report: Is the Bottom In? 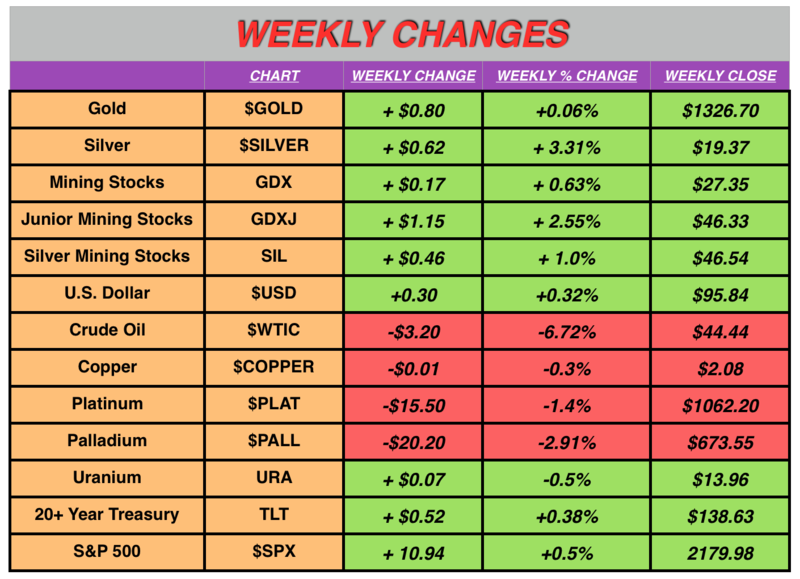 Welcome to Follow the Money’s Weekly Metals Report for the week of September 4th! The metals appear to be finding a floor, after a dismal jobs report on Friday led to the market realizing what most of us here have been expecting all along; no rate hike until at least December. That forecast is not based on wild prognostication, but on weak economic data, lower than expected jobs numbers, inflation below “target” (using Gvmt numbers, not actual inflation), and the logical assumption that the Fed does not want to risk a sharp downturn before the election. After Friday’s report, commodities popped and the metals surged. Interestingly, the dollar rose in conjunction with the metals and commodities. The weekly lows in the metals coincided with support levels mentioned in previous weeks; $18.50 and $1308, respectively. While bouncing off of key support is encouraging, the volume was not overly impressive. More on that in the charts below. So, does this mean we’re all clear and it’s time to back up the truck? Prudence is warranted as several overhead resistance levels still need to be to be cleared. As traders and investors, it serves us well to have a firm grasp of both the bull case and the bear case. While certainly not a prediction, it’s very possible that some “positive” data could be released in the weeks ahead that gives the Fed cover to continue talking about a rate hike. Remember, good data helps the political establishment and there is ample incentive to “massage” the numbers. How long will the market continue to pay attention to Fed jawboning? Nobody knows that for sure, but monitoring price and volume, in response to their prognostications, will give the best indication as to when they begin to lose whatever credibility remains. My personal strategy is to dollar-cost average into physical gold and silver each month, regardless of the price. That’s an insurance policy. I like to add mining stock positions on steep pullbacks in the context of a longer-term uptrend – as is the case now- while keeping some dry powder in case the selloff continues longer than anticipated. Below is a brief synopsis of several stories that expand upon some of the trends being tracked at Follow the Money. I hope I don’t come off as overly cynical in these brief commentaries. The way I see it is that you can either become overly bitter [I’ve been there!] or you can remain vigilant while simultaneously having some fun pointing out the excessive tomfoolery. 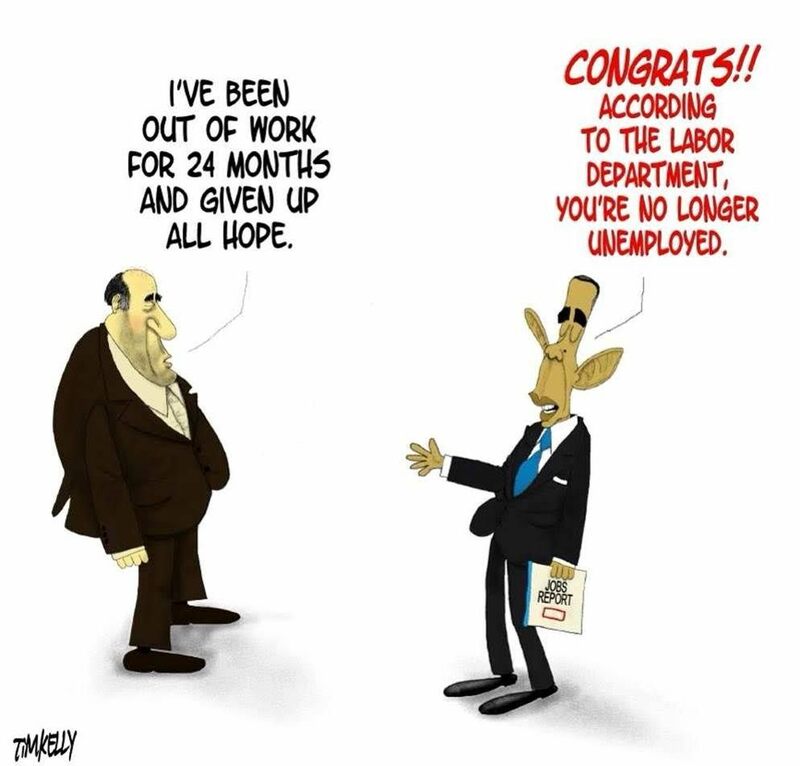 That said, if you lost your job recently, sarcastic comments about Friday’s jobs numbers may seem callous. I am truly saddened by the current state of affairs and thankful that my ultimate hope is not in any political leader, central bank policy, or even precious metals. My intent is to strike a healthy balance, as these are certainly serious issues that will have lasting effects. Bill Gross: The Fed has mastered market manipulation. The fact that the Fed has “mastered market manipulation” is likely old news to FTM readers. (If this is all new to you, that’s ok, start here.) What is significant to us as trend followers and investors, however, is the recent flurry of financial heavyweights, like Bill Gross, George Soros, Stan Druckenmiller, Nathan Rothschild, etc., openly talking about the prudence of owning physical gold and silver. 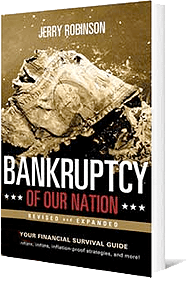 Some, like Steve Forbes, have even been shedding light on the ridiculous fact that a private banking cartel lends money into existence, leaving taxpayers on the hook to repay the freshly created currency…with interest, of course. It’s good work if you’re connected enough to get it and are willing to sacrifice your integrity on the altar of money. If you or I were to try this, it would be called counterfeiting – and rightfully so. 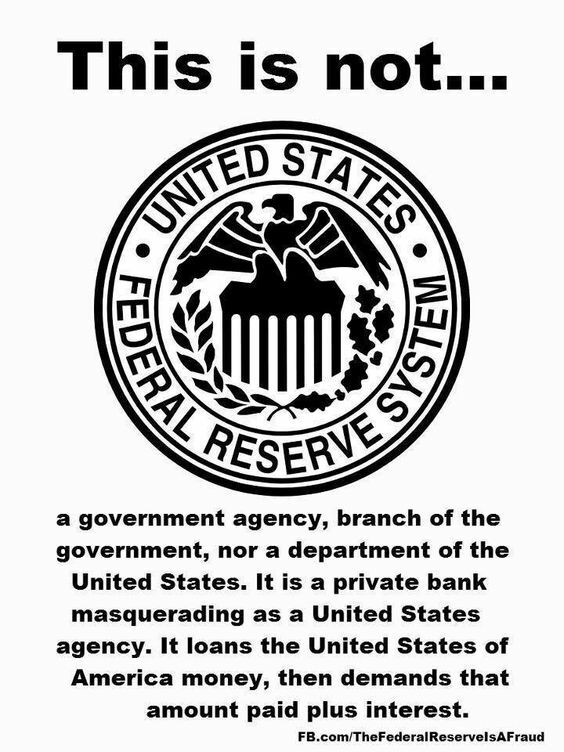 When the private banking conglomerate, affectionately known as The Federal Reserve, engages in the same activity, it’s deceptively dubbed “Open Market Operations.” Sound legit? It’s not, and don’t allow the cloak of academic sounding vernacular and fancy titles to convince you otherwise. This game has been played time and again across the centuries and it always ends the same. What has been will be again, what has been done will be done again; there is nothing new under the sun. Wisdom, not gold, is your most valuable asset. Think independently and respond accordingly. Oil Discoveries at 70-Year Low Signal Supply Shortfall Ahead. The ramifications of Peak Cheap Oil extend well beyond the price we pay at the pump. The geopolitical chessboard is more closely aligned with key pipeline infrastructure, and remaining rich energy deposits, than with the memes relentlessly repeated by media outlets. Faith in the US Dollar is closely correlated to the amount of Middle Eastern oil exports that are exchanged for US Dollars. I place my faith elsewhere. While every word uttered by Janet Yellen at Jackson Hole last week was parsed for clues as to the next move by the monetary masters at the Fed, another major speech was given by Marvin Goodfriend, from Carnegie Mellon University. If I’m ever in charge of the Fed, making this required reading will be my SECOND order of business. FIRST will be dismantling the institution itself. 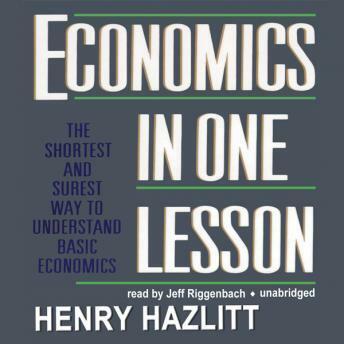 His speech was called The Case for Unencumbering Interest Rate Policy at the Zero Bound. [Wow, this guy sounds really smart already!] The focus was to promote unencumbered negative interest rate policy, which means eliminating obstacles – namely cash. In section 5A, he suspects that “the public is likely to resist the abolition of paper currency.” [I knew he was a smart cookie.] In response, he proposes a “flexible market-determined deposit price of paper currency.” Translation: the money in your bank account and the money in your wallet would have different values. You really can’t make this stuff up. Whether this exact policy actually comes to pass is not the point; the key takeaway is to expect unprecedented and extreme policy measures going forward. These wonks do their best to dress up ludicrous proposals in sophisticated ivory-tower lingo in a futile effort to inspire confidence. I remain uninspired. The War on Cash Continues. 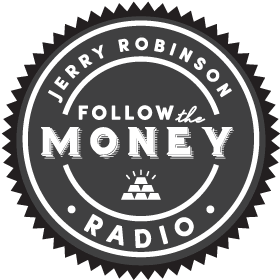 Current FTMDaily member and fellow Platinum member Brad Sebion of MoneyAndTrading.com does an outstanding job of following the money in the escalating war on cash. France’s DCNS does not rule out ‘economic war’ after documents leak. This story highlights the growing threat of cyber-theft and that nothing in digital form is completely secure. This includes “digital wealth.” Tangible assets, such as gold and silver, are a logical hedge. Jobs Report. I won’t expend too many spare brain-bytes on this one, as my hampster is already running at full-speed. Friday’s report came in below expectations (151,00.) A rate hike in Sept is highly unlikely. 😮 That’s my surprised face. 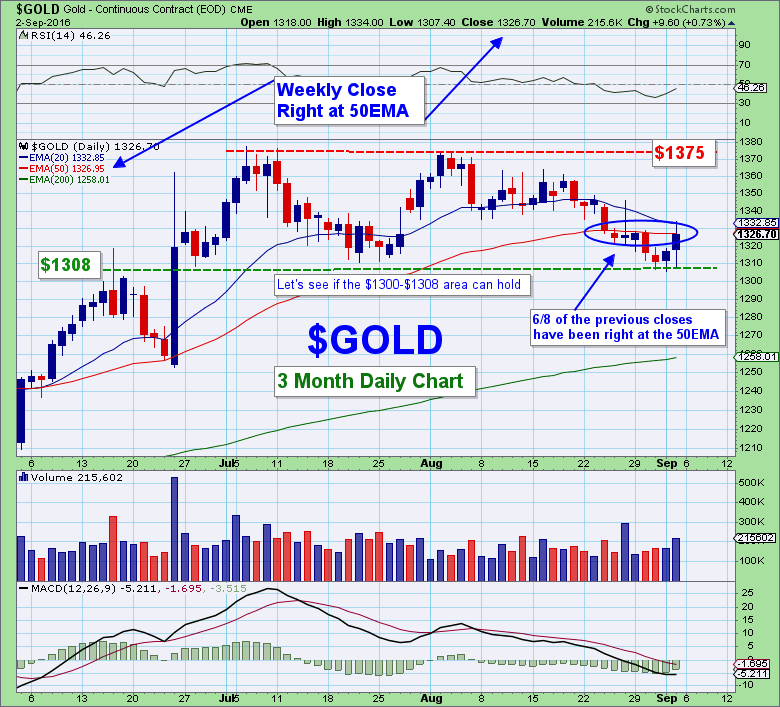 Gold closed the week just pennies below its 50MA, remaining within the confines of its several-month trading range. The short-term trend is attempting to reverse, but getting above $1340 and $1375 remain near-term obstacles. The long-term and intermediate trends remain up and firmly intact. Unlike silver, gold had fairly strong volume on Friday’s $10 pop higher. Gold closed within a few cents of its 50MA and the chart below shows that gold has closed within a few cents of its 50EMA on six of the last eight trading days. Institutional trading algorithms do use these lines. The $1308 floor also held as support several times this week. Below $1308 lies support at $1300 with very solid support down at $1250. I’m certain that the heavily short commercial banks are gunning to take out $1300 to the downside. The charts indicate there’s likely to be more upside to this move. The big question is whether there will be enough momentum to clear the top of the respective trading ranges. After a sharp (but brief) selloff, silver is back above $19 and in a struggle to regain $19.50 and subsequently $20. Clearing $20.75 would set the stage for a run towards $22. 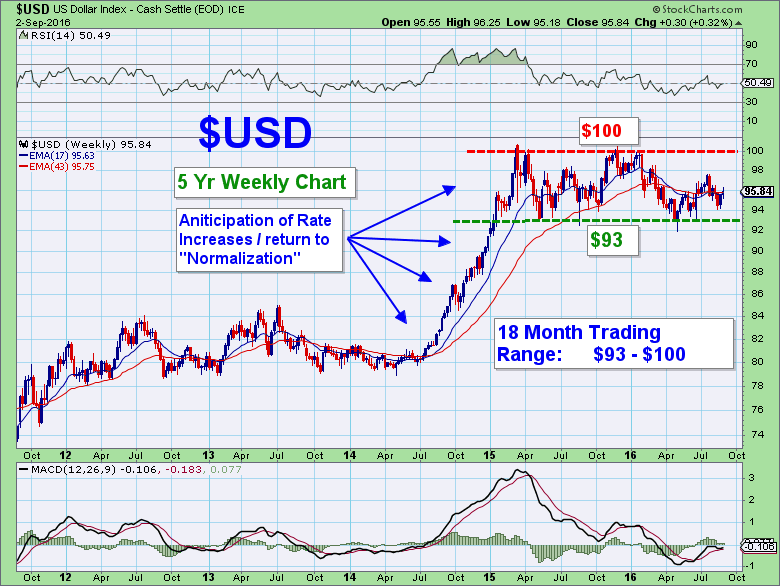 The critical $18.50 held strong this week, with price testing that level on several occasions. Should $18.50 give way, there is very solid support at $18. RSI and momentum are turning up. If I were short the metals or miners and came home from work Friday to see these charts, I would be inclined to cover on Monday. 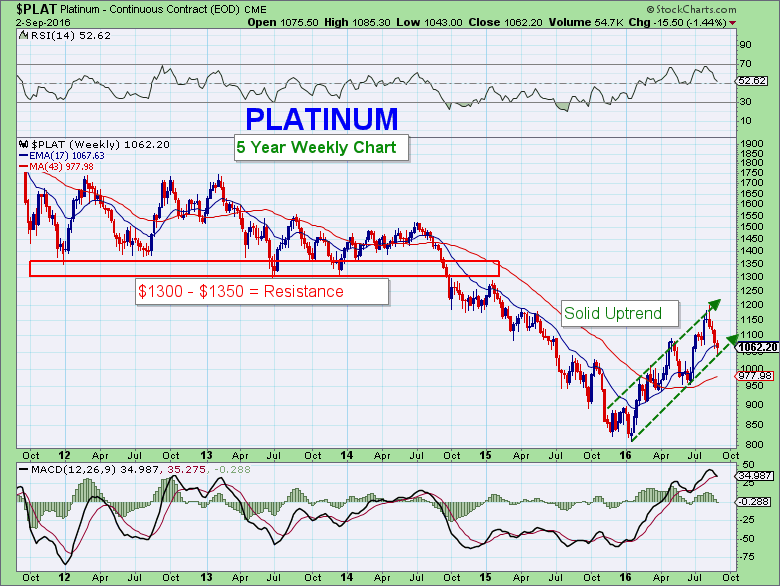 On the long-term chart above, you can see that once a major uptrend gets underway in Platinum, it tends to run for quite some time and make very large percentage moves. 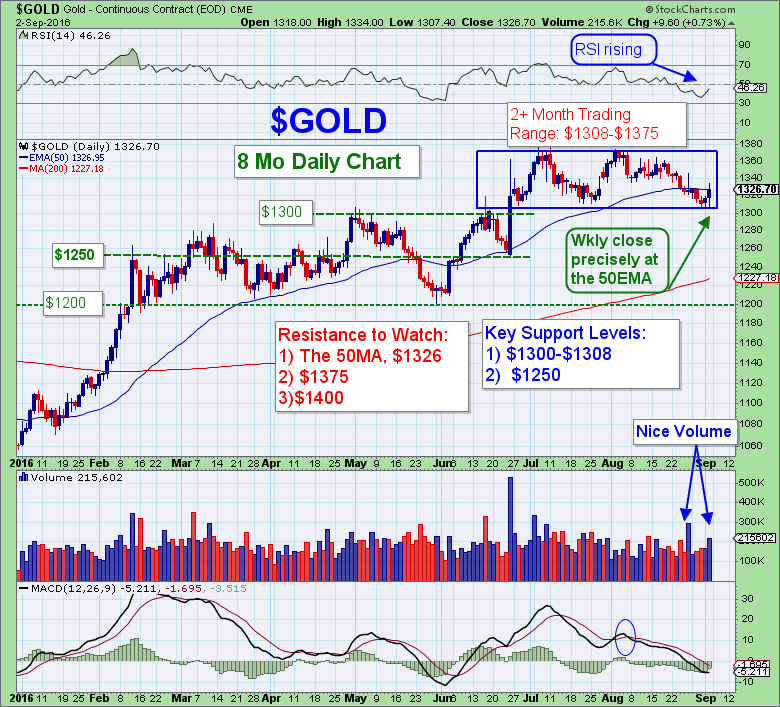 The charts indicate that we are likely just entering the early stages of a new major uptrend. 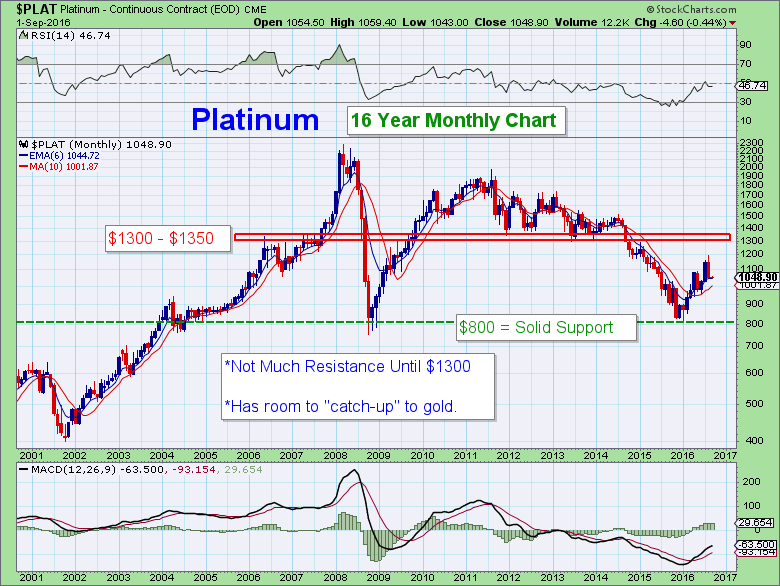 Fundamentally, the case for both platinum and palladium is extremely compelling. Potential supply shortages loom. As a primary component of automotive catalytic converters, latent demand driven by millions of new drivers in China and India should serve to increase demand just as future supplies are likely to come under pressure. Platinum typically carries a premium to gold, but currently trades at a $275 discount. Look for platinum to play “catch-up” at some point. 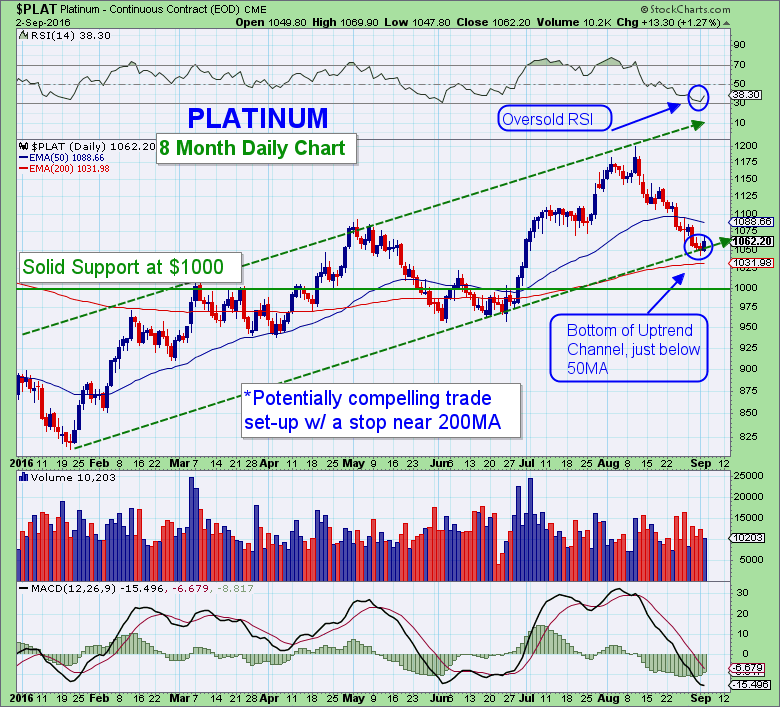 Platinum is in a confirmed uptrend, oversold on its RSI and just below the 50MA. Combined with its solid fundamentals, this looks to be a compelling entry point, with an appropriate stop loss. The 200MA is $31 below the current price, a line where institutional money often bails if breached to the downside. PPLT is one way to play the platinum market. SPPP is a closed-end trust that invests in physical platinum and palladium bullion, although volume is low. 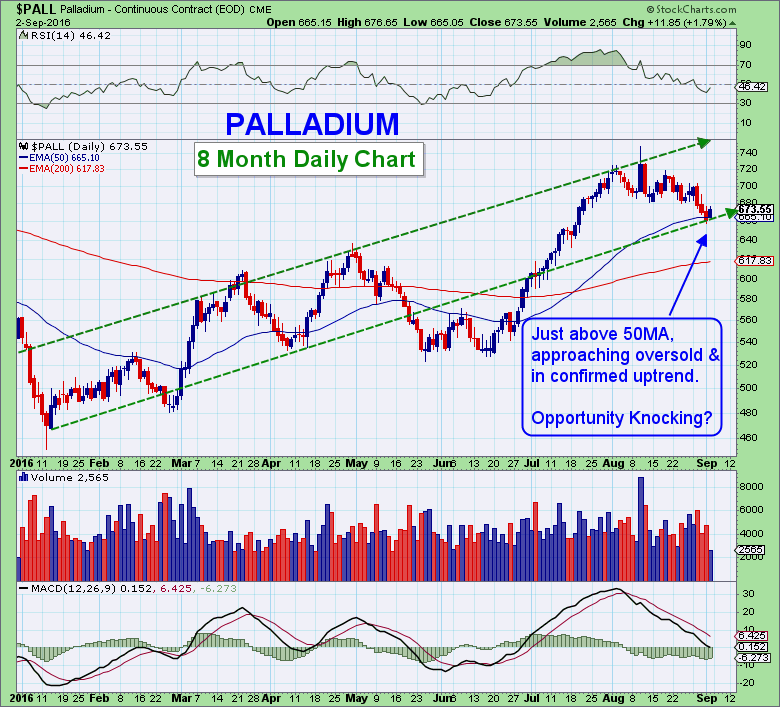 Palladium has a very similar fundamental story as platinum, but is even more volatile. 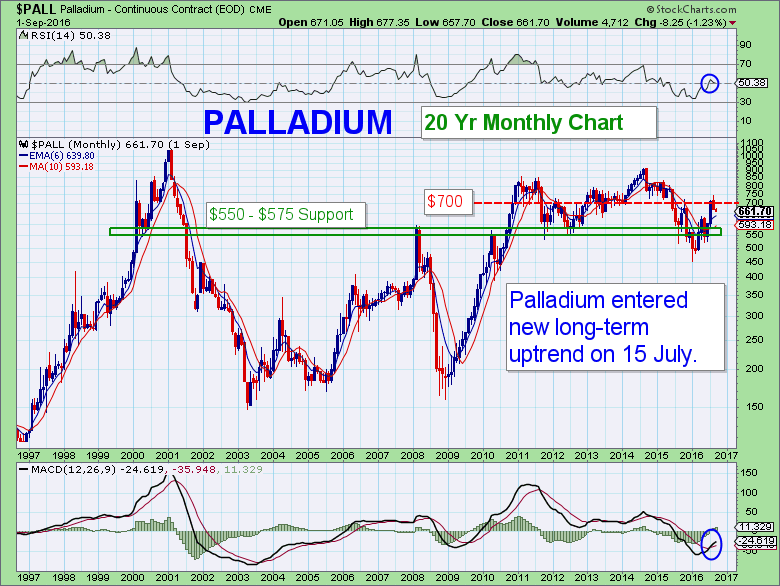 As you can see on the chart above, palladium climbed almost 11-fold in just 4yrs from 1997 to 2001 and has had several other big moves as well. That volatility works the same on the downside, so exercise caution if trading palladium. FTM called a long-term uptrend in platinum on July 15th and the metal is currently experiencing its first meaningful pullback since then. Resting just above its 50MA and about 8% above an up-sloping 200MA, palladium is presenting a potentailly compelling opportunity. The mining stocks are showing signs of reversing after experiencing the deepest correction since breaking out of a brutal downtrend in January. RSI and momentum are beginning to turn back up. On the upside, watch for a break above $27.50 and the previous high of $32. That would set the stage for the next surge higher. On the downside, there is support at $23.75 that will soon meet a rising 200MA, currently at $23.58. Below there lies very solid support at $22.50. 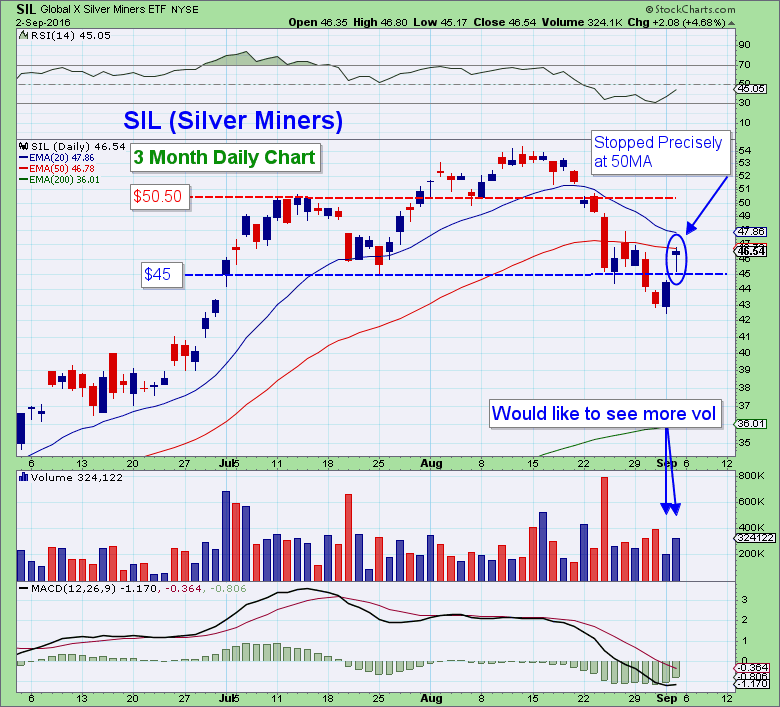 Friday’s 5% surge took SIL back above the very important $45 level. Note the significance of $45 on the 5-yr weekly chart above. The rally on Friday was stopped at the 50MA precisely. Clearing that will be the first hurdle, followed by $50.50 and then the previous high of $55. Each week I’ll be including one of the charts from Follow the Money’s P.A.C.E Portfolio. I prefer mine to be sprouted, lightly toasted and with some grass-fed butter spread on top. It also looks very cheap on the charts. I’m intrigued by anything that’s down 75%, but FTM members know that it’s often hazardous to your financial well-being to bet against the trend. I’ve learned that the hard way. Let’s watch for signs of a trend reversal. The Trigger Trade Pro system is designed to identify the early stages of new uptrends. The Weekend Briefing, as well as twice-weekly conference calls, will also alert members when both the intermediate and long-term trend has changed. The CoT data remains at historic extremes with a small handful of large banking institutions holding enormous bets on lower metals prices. In silver, the commercial bank net short position only fell by 2,391 contracts (11.96 million ounces). In gold, the commercial net short position fell by 16,262 contracts and stands at a total of 30.12 million ounces. So, back to the original question from the title. Is the Bottom in? As Jerry Robinson often says, “My crystal ball is broken.” If his is broken, mine is smashed to pieces and I was never able to get that thing to work properly in the first place. The strong rallies on Thursday and Friday were encouraging signs of a reversal. This rally likely has room to run further. The big question is whether it will be able to breach the top of the recent trading ranges; $1375 and $20.75, respectively. Breaking above these will set the stage for the next surge higher. 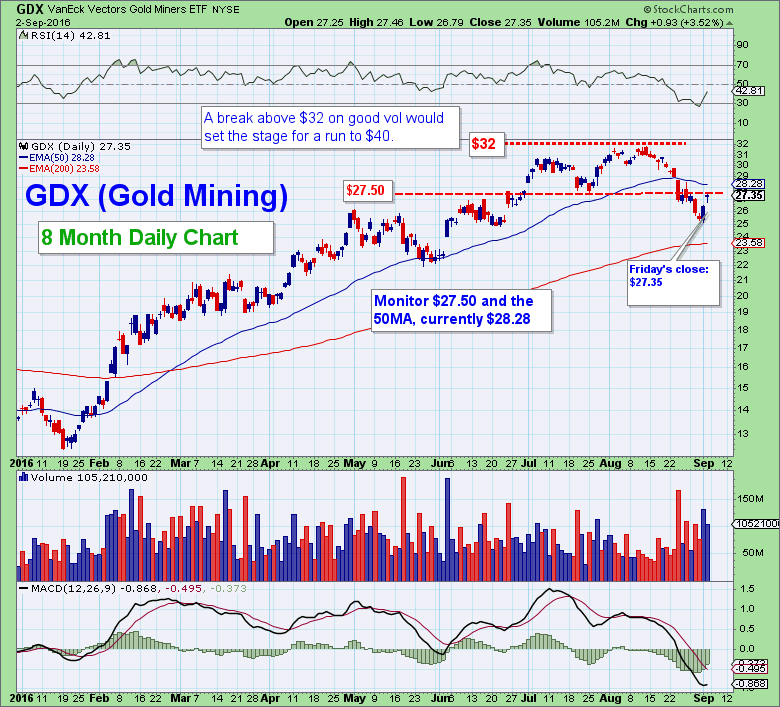 Both gold and the mining stocks are each still below their 50MA. 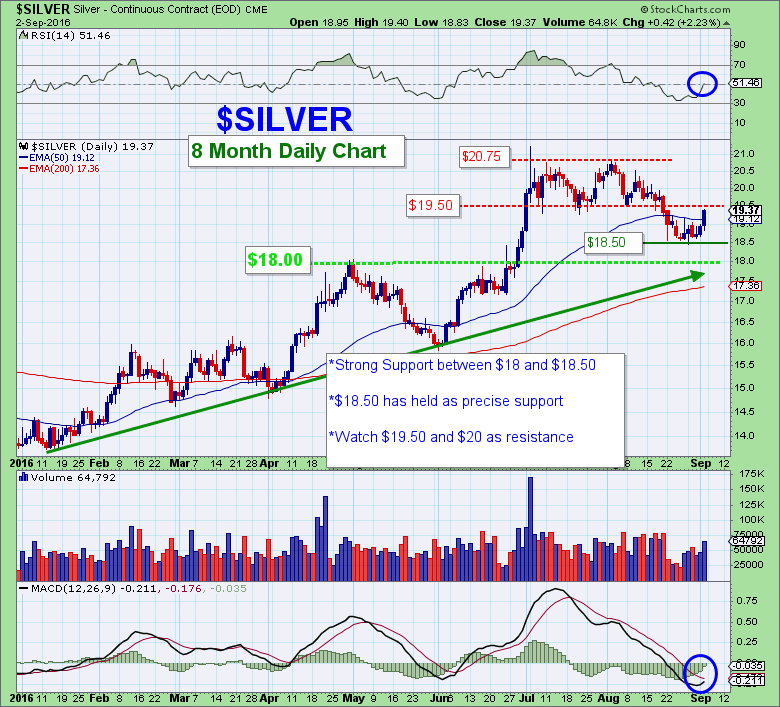 Silver is above its 50MA by a whisker. 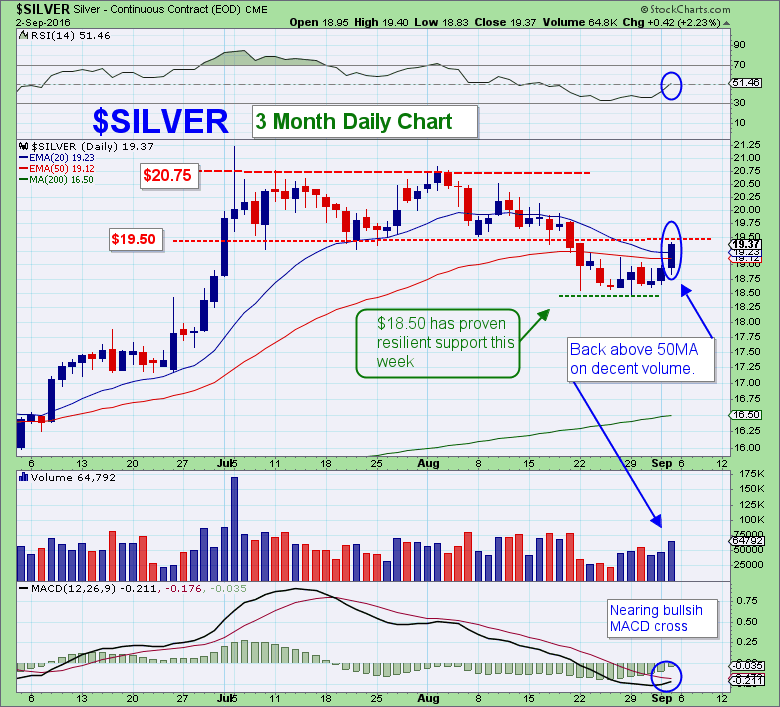 The silver and silver miner rally was on less than impressive volume. 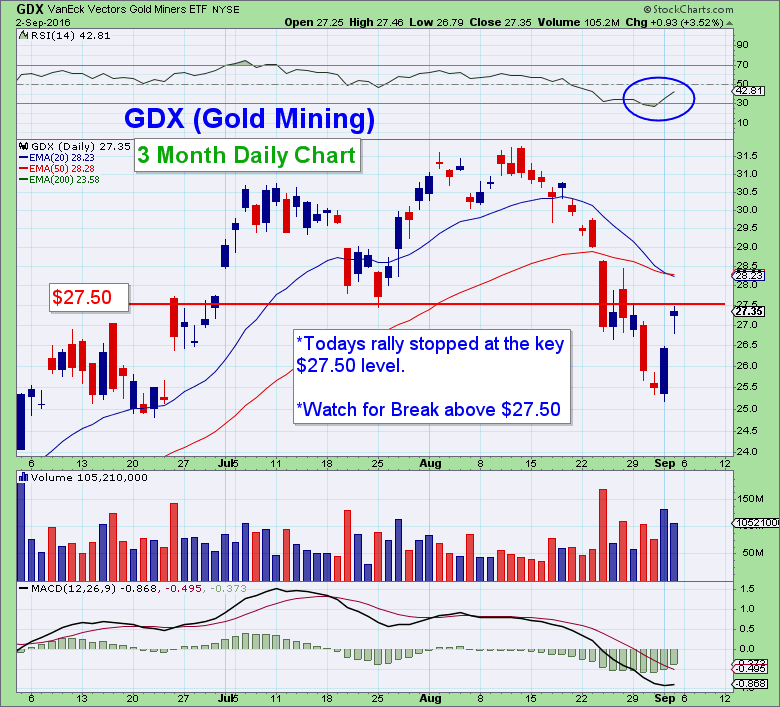 Gold and GDX had fairly strong volume, but not the >1.5x normal volume that would be preferred. The commercial banks remain massively short both gold and silver. It’s kind of like knowing there’s a thief lurking around your neighborhood at night. He might not come rob you blind, but you know he’s out there looking to plunder. Meanwhile, we’re entering a seasonally strong period for the metals. Historically, September is the best performing month, followed by January and October. I’m cautiously optimistic shorter-term and extremely bullish over the long-term. I hope you all have a great week and look forward to “seeing you” back here next Monday.